Krabi (กระบี่: in the local language) could be considered on of the most visited destinations in Thailand by local and international tourists along with Bangkok, Phuket, and the famous Phi Phi Islands. Even though it’s not an island, thanks to its paradisaical beaches, today Krabi attracts tons of visitor from all over the globe. The city is part of the province of the same name, which includes over 80 islands (including famous Koh Lanta). 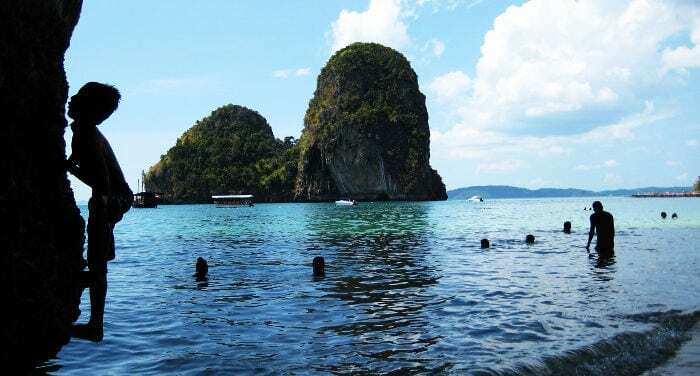 The entire region hosts half a million people while just the city of Krabi is inhabited by 60,000 individuals, mainly Thais (even though a small percentage is made up of foreigners that work and live in this part of the country). As opposed to other tourist destinations located in the east of Thialand (like Koh Samet), Krabi, being located in the south along the Andaman Sea, is a very rainy area, especially during the low season that goes from April to October. Thanks to low-cost airlines like Air Asia or Nok Air, you can reach the airport in Krabi from various Thai cities.